The field is a combination of numerous disciplines, such as psychology, sociology, engineering, biomechanics, industrial design, physiology, anthropometry, interaction design, visual design, user experience, and user interface design. In research, human factors employs the scientific method to study human behaviour so that the resultant data may be applied to the four primary goals. In essence, it is the study of designing equipment, devices and processes that fit the human body and its cognitive abilities. The two terms "human factors" and "ergonomics" are essentially synonymous. ^ "Safety and Health Topics | Ergonomics | Occupational Safety and Health Administration". www.osha.gov. Retrieved 28 March 2019. ^ "Home Page of Environmental Ergonomics Society". 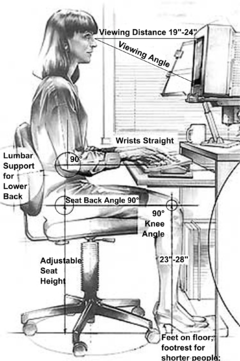 Environmental-ergonomics.org. Retrieved 6 April 2012. ^ a b "Workplace Ergonomics: NIOSH Provides Steps to Minimize Musculoskeletal Disorders". 2003. Retrieved 23 April 2008. ^ Advances in The Ergonomics in Manufacturing: Managing the Enterprise of the Future. [AHFE Conference]. 19 July 2014. ISBN 9781495121036. ^ "Association of Canadian Ergonomists - about us". Association of Canadian Ergonomists. 2017. Retrieved 16 May 2018. ^ "Mission". Association of Canadian Ergonomists. 2017. Retrieved 16 May 2018. ^ de Rezende, Leandro Fornias Machado; Rey-López, Juan Pablo; Matsudo, Victor Keihan Rodrigues; do Carmo Luiz, Olinda (9 April 2014). "Sedentary behavior and health outcomes among older adults: a systematic review". BMC Public Health. 14: 333. doi:10.1186/1471-2458-14-333. ISSN 1471-2458. PMC 4021060. PMID 24712381. ^ a b "Ergonomics Policy". risk.nv.gov. Retrieved 28 March 2019. ^ "Ergonomics Policy". risk.nv.gov. Retrieved 28 March 2019. ^ "Survey Methods, Pros & Cons". Better Office.net. Retrieved 17 April 2014.